God is very interested in revealing Himself to the World and to us individually! Ps 19 says that Creation itself is God revealing Himself to us so much so that it says that "the Heavens declare (reveal) the Glory of God". In Gen 3 God revealed Himself to Adam & Eve by talking openly with them and giving them responsibility and a commandment. Sin broke this open revelation. When they sinned God spoke to them while they hid from His presence. He revealed to them a promise of the woman's "Seed" bruising the head of the Serpent! 1Sam 3:21 God revealed Himself to Samuel by the Word of the Lord. Jesus"s answer to Philip in St John 14, when Philip ask Him to shew him the Father was "He that hath seen Me hath seen the Father"
Paul says in Gal.1:15 that God called him "to reveal His Son in me"
Peter, when Jesus asked him who the Son of Man was made this declaration that Jesus was "Thou art the Christ the Son of the Living God" , Jesus then said "flesh and blood hath not revealed it unto thee but my Father which is in heaven". The Hebrew writer says in 1;3 of Jesus that "Who being the Brightness of His Glory and the express Image of His person," reveals to us His Deity. Christmas is all about REVELATION!! God is a progressive Revelator both in the span of time and on a individual experience. It is God"s utmost desire to reveal Himself to us through His Son Jesus the Christ! 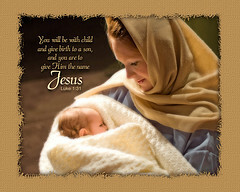 The Incarnation of God in the flesh is God"s greatest Gift to the World! Christmas really comes to us the Day when Jesus Christ is revealed to us as Very God!! Is 9:6 He shall be called the "Everlasting Father"